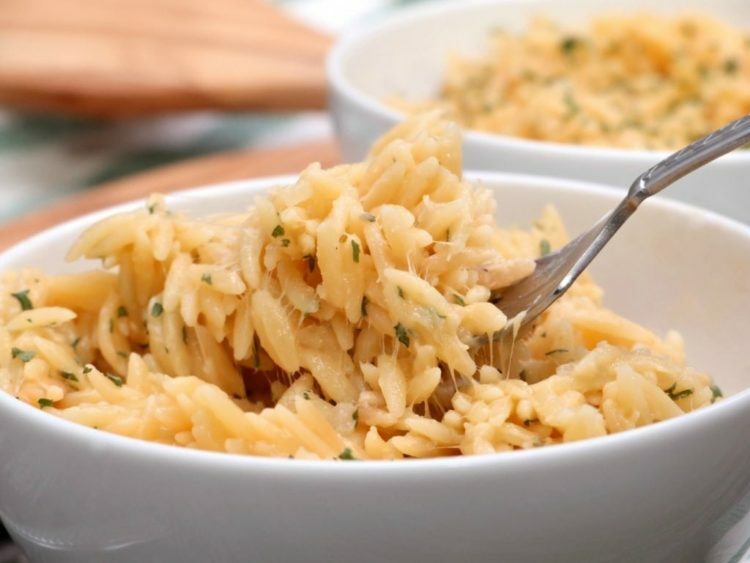 "Creamy, cheesy orzo recipe simmered in chicken broth with onions and garlic! Quick, easy and delicious side dish!" Visual learner? Watch me make this 3-cheese orzo from start to finish! In the past, when it came to side dishes my boys, like most kids, would always vote for mac n cheese or french fries. Hey, I tried. In an attempt to expand their side dish likes I started creating a ton of different side dishes. Most of them were fails (for them) but two managed to make the cut, and those two were veggie tater tots and 3-cheese orzo! Whew, I’ll take that win! Today we’re going to discuss this three-cheese orzo! If you have kids, try this out on them and see how it goes. 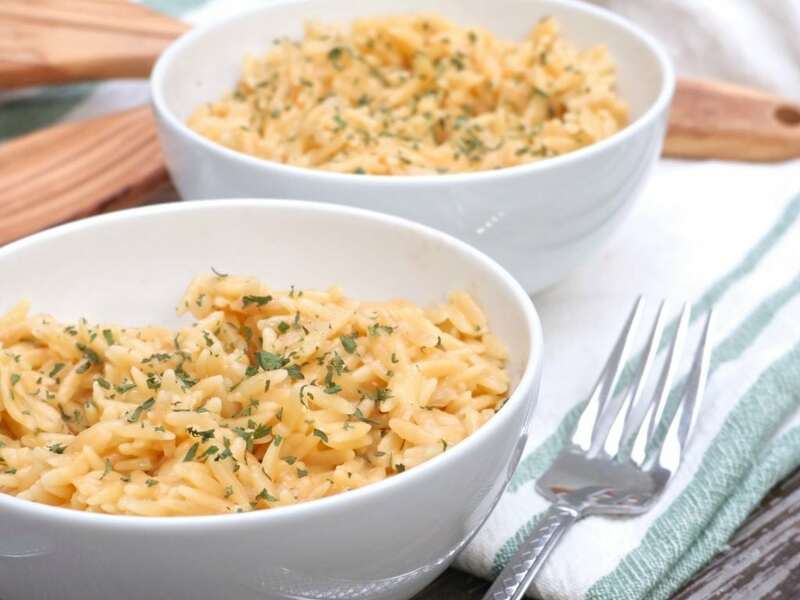 Heck even if you don’t have kids, orzo makes a fantastic side dish option! What the heck is orzo? Orzo looks a lot like rice, but it’s pasta! You can serve it in soups and salad, but we prefer it plain as a side or even a full meal. It’s not the healthiest side dish option, I mean it’s pasta after all, but man is it a crowd-pleaser and a great alternative when you want something other than potatoes or rice. How do you cook orzo pasta? Well first forget whatever you read on the back of the box because it usually says to boil it in water first. Boo!! I mean, yeah you could fix it that way but here’s how we like to fix it! First, we toast the orzo in some butter, and then we simmer in chicken broth! MMM MMM MMM!!! It’s delicious just like this with nothing else added, for real! But we sometimes like to add onions, garlic, and cheese for a quick and comforting side dish. If this is your first time making orzo, try it plain with just the chicken broth. If you’re a pasta fan, then I can almost promise this will become a staple in your home. For this recipe, I’m throwing in some onions, garlic and 3 different kinds of cheese. Use your favorite cheese here. I switch it up all the time depending on what I have on hand. Today I’m using parmesan, Colby jack, and some mild cheddar. If you really wanna get fancy and make it a full meal you can throw in some peppers/broccoli and sausage/chicken! Stir in orzo and cook until lightly toasted, stirring constantly. Cover, reduce heat and simmer for 10-15 minutes or until most of the broth is absorbed. If you need to thin out the cheesy orzo add a bit of chicken broth or milk. I made this tonight and it was amazing! I used Parmesan and sharp cheddar. It is very flavorful, savory, and easy to make. My only regret is not making more because everyone in the family loved it. Thanks for the delicious recipe!